Taki is a shiitake mushroom or Lentinus Edodes. Taki knows everything about computers and technology. He likes to help his friends out when they are have computer troubles. 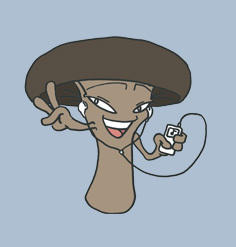 Taki listen to music on his MP3 player and loves to break dance. Taki works very hard in school so that one day he can become a computer software developer.